It’s Adaptable for All Ages. It’s Compatible with Any Curriculum. It’s Ideal for Beginning Readers. Symbol Mastery is a study method that can be adapted for and will appeal to students of any age. Several children in a homeschooling family can work with clay at the same time, on very different levels. 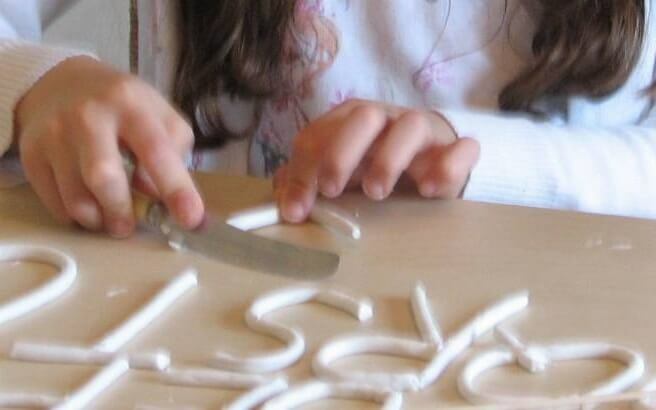 A 4-year-old might be learning to roll and shape the clay, and starting on the first letters of the alphabet. His 7-year-old sister might be working through the word list contained in the Symbol Mastery manual. Their 10-year-old sibling could use the same techniques to master new terms encountered in reading a science book. With Symbol Mastery, the child moves at his own speed and according to his own comfort level. There are no worksheets to complete or written tests. Further, it rests on a concept that should be embraced by all homeschoolers–mastery. Mastery means that the child will fully understand a particular idea or concept before moving on, whether it is an aspect of reading, math, or any other area of study. Once mastered, there is no need for repetition or drill. Symbol Mastery also fits in with whatever approach to homeschooling is followed. A parent following a structured schedule of instruction at home would probably create a specific time and place for Symbol Mastery. A parent who “unschooled” might prefer to leave the clay, dictionary, and a word list accessible at all times, encouraging but not requiring the child to do Symbol Mastery at any set time. Symbol Mastery is an ideal way to introduce children age 4 and up to reading concepts, and to provide a beginning reading vocabulary. It gives children an understanding of both the meanings of connective words and their logical relation to other words in the sentence. This increases comprehension skills. 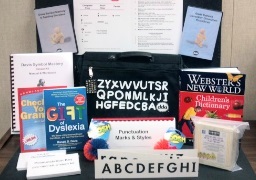 Symbol Mastery also provides an important bridge between reading methods based on phonics instruction and those based on a broad exposure to children’s literature. Printed Samples of Letters, Numerals, and Punctuation Marks. 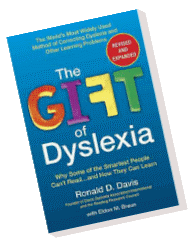 The book The Gift of Dyslexia explains the steps of Davis Symbol Mastery. 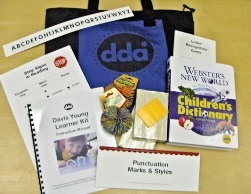 More information and matarials are contained in the Davis Young Learner’s Kit (for ages 5-7) and the Davis Orientation and Symbol Mastery Kit (for ages 8 and up). For homeschoolers, a kit is a terrific investment, as it can be used for many years and shared among all the children in the family. Please explain the importance of teachers temperament while working with a child on reading together. That’s a very important observation — and especially important in the homeschooling context. Anything that can cause emotional upset to the child will also tend to make reading more difficult. Do you have specific questions or concerns that you want to discuss? Do you have a Math Book and specific tools for Teaching Math? Even better, do you offer training for tutoring/teaching math? We sell some math dictionaries at our online shop, at https://shop.dyslexia.com/ – the dictionaries are important because much of our work is based on using clay to model word meanings and concepts. Because dyslexic students process language differently, dyslexic students’ math problems often stem from confusion about word meaning, and often words that have one meaning in common use have a different meaning when used to represent mathematical functions or concepts. Sheerengul, I am sorry but The Gift of Dyslexia has not been translated to Urdu. Because professional training for Davis requires that students work in a participatory, supervised setting, we also do not offer online training.